Time for you to relax and drop off the kids and take a night off! Let Kidz Plaza watch the kids as they enjoy the 3-story play structure, inflatables, ball pits, interactive floor games, activities, and more. Pizza and juice will be provided. Ages 3 and up. Book now by clicking here! 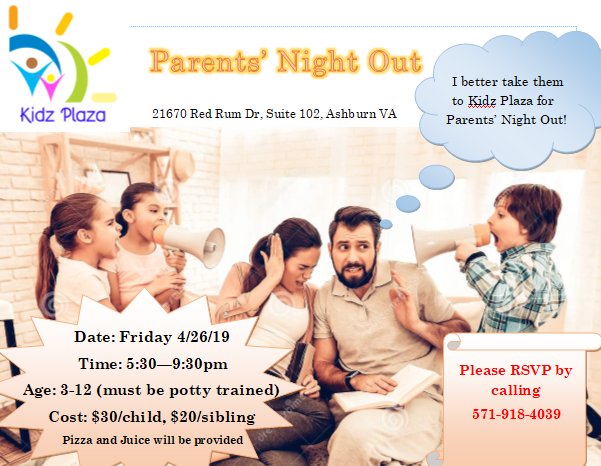 or RSVP by calling 571-918-4039 by 4/25/19. Work at Kidz Plaza! We are Hiring! © 2013-2018 Kidz Plaza Indoor Playground in Ashburn. Kidz Plaza Playground is an indoor play facility located in Ashburn, Virginia 20147 and serving the Northern Virginia Loudoun County area including Leesburg, Sterling, Lansdowne, Brambleton, Broadlands and beyond.